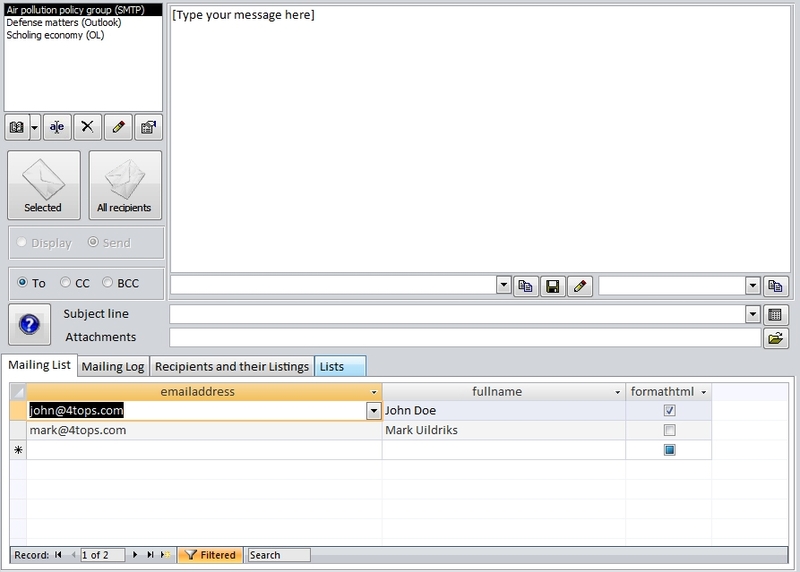 Listbox showing the available mailing lists. Select one to make it the current mailing list to work on. Text editing area, see Prepare email. Opens a dialog to let you change the name of the current mailing list. Opens form ImportBuiltIn to easily add records to the current Built-in table. Enter, Import or Past. Opens form Settings: select features, enter license, SMTP. Display: allows you to preview and make individual changes to the emails you want to send. Send: emails are sent immediately. If you want an email to be sent to the recipients on the mailing list, you can choose to have a separate email created for each (To), or you can have 1 email created and the CC or BCC filled from mailing list. When you use To, each recipient will have the impression that the email is sent to him individually. Using CC allows the recipient to reply to all users, which may be convenient in case you want an open discussion between members. Combo box listing the fields in the current mailing list. Insert Field inserts the selected field from the Fields combo box into the email text at the cursor position. Select and or edit the subject line of the email you will be sending. Opens table Subjectlines to add, edit or remove lines that will be frequently used. Shows the attachments that have been selected. Multiple attachments are separated by ;. Select attachment opens the file selection dialog.